Is email marketing effective? As a small business owner, you might be asking yourself that very question. You’ve read countless stats and case studies that have supported the enormous growth companies can experience with email marketing, but you have yet to taste much if any of that success yourself. That may have less to do with the benefits of email marketing and more to do with your current marketing techniques. Every first-time small business owner makes mistakes, but those can cut especially deep if they lose you customers or sales. This article is designed to help you skip some of those mistakes. Instead of figuring it all out by trial and error, we’ve found 12 email marketing growth hacks you can use today. Like most hacks, these are convenient and intended to drive results. Whether you need a higher open rate, click-through rate, or more conversions, we encourage you to try any of the email marketing hacks on this list. You won’t regret it! As a small business owner, you do a lot of duties yourself. You’re probably in the process of hiring a well-rounded staff, but you’re not quite there yet. This is why email marketing automation can be such an asset to your growing business. This is one hack that will deliver the biggest results. While you will have to spend money on business email marketing software, it will pay back dividends with time. According to November 2018 data from Emailmonday, most marketers use automation for email marketing above all else (64 percent). It’s also popular for lead targeting and profiling (26 percent) and dynamic content personalization (23 percent). The above chart shows a few ways email marketing automation can help you. Through automated customer onboarding and welcome sequences, you can begin nurturing your growing customer relationships. Automation can also help you personalize your emails, create templates for tailored messages, and send emails around the clock. You have enough to do right now to make sure your company succeeds. Email marketing automation is like another employee. It does a lot of important jobs for you with little input needed on your part. Who doesn’t want that? We’re sure you’re concerned with building an email list that’s as big as possible, so the thought of cutting anyone off your list is astonishing to you. To that, we must ask you this. Would you rather have 2,000 people on your email list with 500 of them engaged or 700 people on your email list and all of them are engaged? Engagement matters more than an arbitrary email subscriber count. That number doesn’t guarantee anything. It doesn’t mean every subscriber will open every email. It definitely doesn’t promise that the reader will do anything with the email, such as interact with content or click links. It’s much, much more effective to cut the dead weight. Your list may be smaller, but you can ensure the people who receive your emails want to receive them. That increases the likelihood of them opening and clicking through your messages. Maybe this won’t happen with every last email, but it will with most. You might be saying, “but wait! What if these would-be customers come back?” It could happen, but it could also not. You can put these inactive subscribers on another list if it makes you feel better, but you don’t want them on your main email list. They’re getting in the way of those who want to be on the list. You can use automation to prune your email subscribers list. Alternately, you can give inactive users the option to unsubscribe themselves, but if they’re not opening and reading your emails, they might not do that. Social media integrates so beautifully with email if you know how to do it right. For instance, if you have a solid social media following, then you can rely on that following to get more email subscribers. How? You can entice your audience by offering discounts or freebies on social media that only your email subscribers can take advantage of. You can share parts of your most successful emails on Facebook, Twitter, and the like. This shows people what they’re missing out on by not subscribing to your email list. 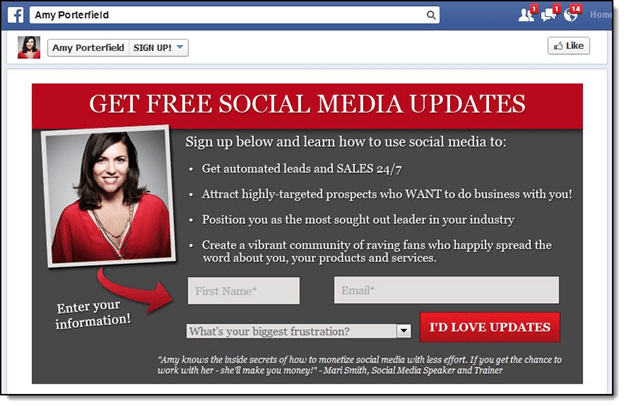 You could even add an email list subscription button on your Facebook Business Page or Instagram account. You can also do the opposite. Maybe you have a strong email subscriber list but your social media accounts are a little lacking. By ending your emails with a request of following or liking your social pages, you could get more engagement. You can even make it easier for your readers to follow you on social media by adding share buttons for each platform you use. Want to know another quick yet effective email marketing growth hack? It’s all about your email subject line. We’re sure you already know how very, very important the subject line is. It’s your first and sometimes last chance to make a stellar impression on the reader. Personalization can be effective, as can emojis in some instances. It all depends on the type of company you run and your audience. 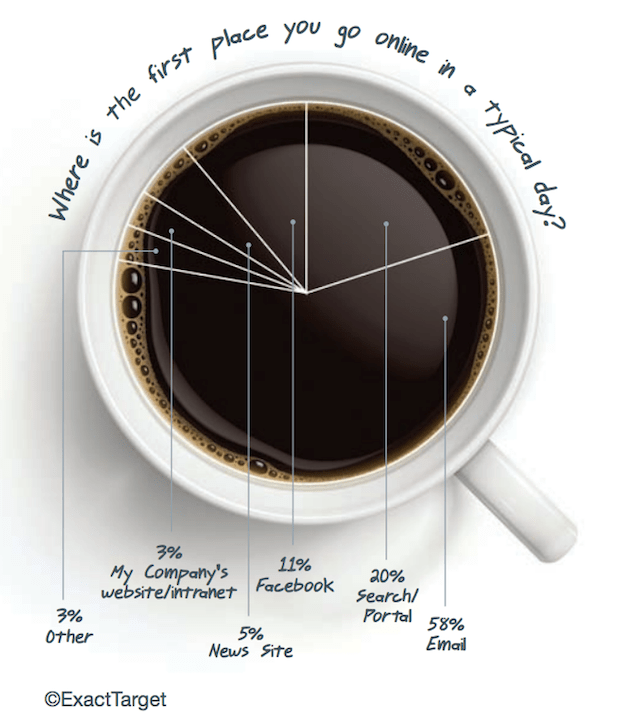 According to Emailmonday, 58 percent of people start their day by going through their email inboxes. Still, even before they’ve had their daily coffee, most people would notice a badly-formatted email that’s not optimized for mobile. With over half of people accessing their emails on their smartphones or tablets, if your messages aren’t mobile optimized, you need to change that like yesterday. Here is a neat tool that will help you discover whether your website needs to be improved or not. That said, don’t forget the rest of your audience in the process. Sure, more than 50 percent of people today read their emails on a mobile device. What about the other roughly 50 percent? They still check email on their computer, the good, old-fashioned way. Your site has to be optimized for them as well. Freebies are positively irresistible. It’s hard to turn down free stuff, after all, and few people will want to. A solid coupon or discount could finally be enough to push that reluctant would-be customer into checking out. Just look at this example. Cheap cake? Sign us up! 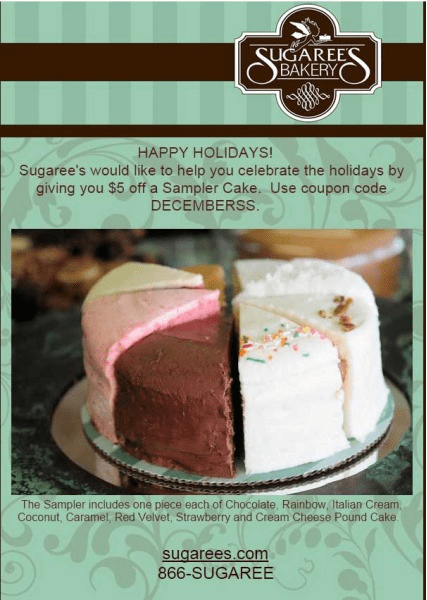 Even if you don’t have something as tantalizing as cake to sell, you can still lure in leads with a discount. You just have to make sure the item you’re discounting is a.) targeted to your audience and b.) something people actually want. If you’re a clothing retailer, for instance, you wouldn’t want to discount last season’s stock. Everyone can see right through that. You want to give people something good, just not at full price. It can be scary to discount anything during your first few months as a small business owner. If you choose a product that resonates with your audience, though, the high engagement should more than make up for the slightly lower price you’re selling for. Your customers are always keeping busy. If they open your email, what’s going to incentivize them to read it through to the end? You can’t always be giving things away for free or offering discount codes to get customers to the figurative finish line. With most people spending maybe 20 seconds on your email according to Marketing Sherpa, you have to hook in your readers fast. One of the best ways to do that is to write with storytelling elements. Crafting a story like your favorite novelist can get readers on the edge of their seat. Even if your content is a little drier (which happens sometimes), spicing it up with storytelling will make your copy sing. Let’s say, for instance, you write about your struggles to become a small business owner. You can talk about your sadness and disappointment in your ordeals until you finally opened the doors to your own company. Then you can talk about your feelings of triumph and excitement. People want to read about real people. If you give your audience something interesting to read, not only will they hang on your every word, but they will wait with bated breath until your next email. Not every small business has a dramatic coming-of-age story, and that’s okay. If you don’t quite have enough trials and tribulations under your belt, you could always try a different tact for email writing. We’re talking about humor. Now, humor is not for every kind of company, that’s for sure. You must have to be…well, funny. Otherwise, your emails could come across as brash and even offensive. Humor isn’t something you can force, either. That means if you don’t think it’s in the cards for your company, then it’s probably not in the cards. If you can harness the power of humor, a few funny stories or relatable anecdotes injected into your emails will not only get your subscribers reading, but they’ll be chuckling as they do so. That again increases anticipation for your next email. You might be kind of shy about your email frequency. After all, you’re a new company, and you don’t want to turn people off by sending too many emails too often. Everyone has been bombarded by that one company that doesn’t know when to stop. What do you do when those emails become too much? You unsubscribe or send the emails to the spam filter. There’s a balance between sending too few and too many emails. Sending too infrequently makes people forget about you. Sorry, but it’s true. Without regular emails, it becomes an out of sight, out of mind situation. Sending emails too frequently can lose subscribers. While there are tons of stats about what times to send your emails, what about how often? eCommerce automation service Omnisend, which targets small businesses, says two to four emails monthly is the sweet spot. That’s how many emails more than half of Omnisend’s clients sent. 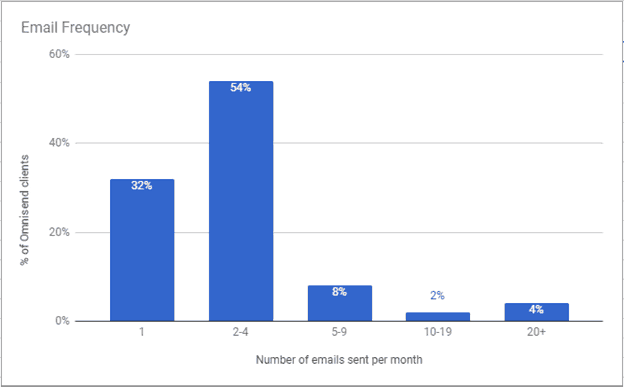 Sending just a single email monthly was the second most popular choice at 32 percent Sending a bit more, like five to nine emails, wasn’t very desirable. Only eight percent of respondents did that. Going anywhere over nine monthly emails seemed to be too much. Just two percent of respondents said they sent 10 to 19 emails each month, while four percent said they emailed customers more than 20 times monthly. These stats are useful, but they should be taken in a vacuum. After all, Omnisend’s clients may not be indicative of the mindset of the average small business owner. In the end, we advise you to do what works for your audience. If they want more emails, then send more emails. If they want fewer, then send fewer. In business, your reputation is everything. One way to damage your reputation is by making grammatical and spelling errors. Proofreading is a rookie mistake that’s really unfortunate mostly because it’s so preventable. If you or someone else on your team take the time to proofread your emails before they go out, you can catch most mistakes. There are countless grammar and spellcheckers online, and most of them are free. Your automation software can’t catch everything. In this regard, a pair of human eyes is your best defense against typos and spelling mistakes. Here are a few funny examples of typos and email errors. They’re funny because they didn’t happen to you, but they serve as a poignant reminder to proofread! You know what else really turns off almost any audience? A poorly-compiled email. Perhaps it’s an obviously dead link. Maybe your video doesn’t show up or your image is broken. Regardless, mishaps like these could cost you, subscribers. That’s why, in addition to always proofread your emails, you need to test them before you send them. Automation makes your life as a small business owner easier because it does a lot of dirty work for you. However, you cannot become over-reliant on it to your company’s detriment. Use your marketing software to test how the email will look. Account for both desktop and mobile readers, even if the latter is much more common. If an element in your email looks wonky, fix it before you send it out. Your company’s email is competing with hundreds of other emails in the average consumer’s inbox each day. It must look polished, clean, and engaging. This isn’t a super-actionable hack you can use right away, but we thought it was a good note to end this on nonetheless. Your email marketing process should always be improving and evolving. With a healthy influx of leads coming your way, you can never get lax in your engagement and nurturing methods. You might try adding videos in your email and find that works out phenomenally for you. You could change your email frequency. After your company finds its footing, you might hire an email writer or a graphic designer to spruce up your emails. Don’t be afraid to go back and change what’s not working. Email marketing isn’t a static thing. There’s always room for improvement, even if you’re nailing it. 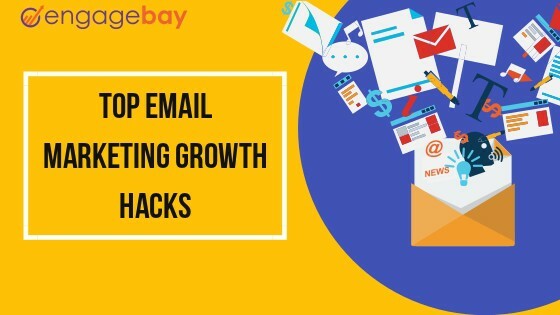 If your email marketing is a little lacking, any of the 12 email marketing growth hacks we covered should help you identify how to change that. We know you have a lot to do running a small business, but it’s worth taking the time to better your email marketing. You’ll see more growth and thus more sales.